(Scientific Name: Hydnum repandum) Irregular in shape, the Hedgehog fungus has an indented or funnel-like cap that ranges in size from 1 inch to over 5 inches in diameter. Beneath the cap are small protruding teeth-like spines rather than gills and pores that commonly grow on other fungi, hence the name Hedgehog. From white to orange in color, the outer skin of the Hedgehog Fungus covers an inner flesh that is bright white in color and emits a sweetly aromatic smell. Since the Hedgehog texture is somewhat dry, it is best to slow cook this fungus. It can be served with meat, fish and poultry dishes or it can be used as an ingredient with vegetables, soups, stews, pasta, and sauces. It is also good when slow cooked in butter, providing a delicate earthy flavor. When eaten raw, the taste is somewhat peppery and bitter. The Hedgehog Fungus is best served when fresh rather than when preserved and should be eaten within 10 days after harvesting for the best flavor. 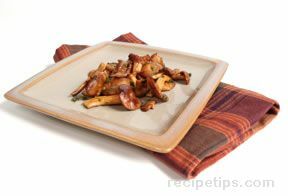 It has a flavor similar to a chanterelle mushroom, which can be used as a substitute if necessary. The Hedgehog Fungus may also be referred to by its French name, "pied du mouton" which translates to sheep's foot.